July was an OK month. 2 of the 13 companies I am currently invested in, paid me their dividends. It was the first time I received dividends from GE. We are 7 months deep in the year, meaning I averaged $22.90 per month. If this continues, we are failing the goal! However, August & December should be great months, so I still have confidence I could reach the goal. The most interesting part to me, is the ability to start comparing to the result of last year. I have been looking forward to this! This is a 2.94% increase. Last year my broker paid AT&T dividends in July. That's why the difference is not too big. Calm before storm, eh? :) Let's hope that August gets you back on track with your goal! Hey Tawcan, I'm sure we'll get more in August! I'll try to keep up. This month is holiday month, so that'll be tougher to save some money, but I'll definitely try. I'm in the same boat as you DfS. July was a very slow month for me and August won't be much better. The vast majority of my stocks pay out in March, June, September and December so I count on those months for a boost. Keep chugging away and we'll hit our goals. We will probably do just fine, if we continue to invest in quality companies. KO and GE. Two dividend stalwarts that seem to be in every long term dividend growth portfolio. I still wouldn't worry too much about reaching your goal for 2015. First, as long as there is growth year over year you are on the right track. 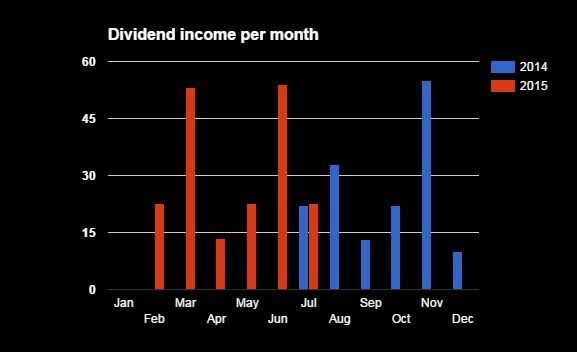 Second, the big months, September and December have yet to occur when most dividends are paid out. Keep up the good work. I'm with you! September and August look very promising so far. I haven't totalled mined up yet for July but I imagine it is similar to everyone else's. 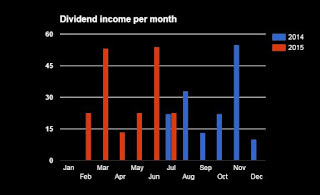 Dividends are dividends and mean money in your pocket! Hope to see you more often.